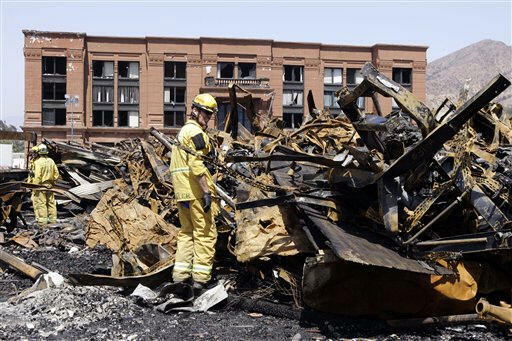 [June 03, 2008] UNIVERSAL CITY, Calif. (AP) -- Workers using a blowtorch on the roof of a movie set building facade at Universal Studios accidentally set a huge fire that swept through the back lot, fire officials said Monday. Workers had been using a blowtorch to heat asphalt shingles to apply to the roof early Sunday, said Los Angeles County Fire Chief Michael Freeman. They finished about 3 a.m. and followed policy of standing watch for one hour, then left for a break, he said. A security guard spotted the fire and reported it at 4:43 a.m., Freeman said. The fire erupted on a streetscape featuring New York brownstone facades at the 400-acre property. It then destroyed a King Kong attraction, the courthouse square from "Back to the Future" and a streetscape featured in "Spider-Man 2" and "Transformers." The blaze also gutted a building housing 40,000 to 50,000 videos, but Universal Studios President and Chief Operating Officer Ron Meyer said there were duplicates of everything. The theme park reopened Monday, giving tourists a view of real-life disaster in the make-believe world of Hollywood. The smell of smoke hung in the air as guests streamed in when the gates reopened and tourists on the park's tram ride applauded firefighters as they drove past. At least a dozen fire trucks remained on the lot as smoke rose from thick, twisted piles of girders. "We were a bit shocked," said Danish tourist Morten Jull, 20. "We were like, can this be?" The pass by the fire scene was brief. The tram also drove by undamaged sights, including sound stages, the "Jurassic Park" area where dinosaurs spray water at visitors, the Bates Motel from "Psycho" and Wisteria Lane, scene of TV's "Desperate Housewives." Later, on a viewing platform overlooking the back lot, several people surveyed the destruction. "It's sad for Hollywood," said Ismael Garza, 53, a stage manager. Low water pressure forced firefighters to tap lakes and ponds at Universal, which is working studio as well as a theme park. The pressure problems may have been due to the volume of water being poured on the blaze -- 18,000 gallons a minute at the peak, Freeman said. 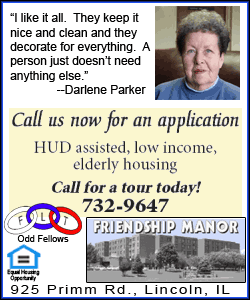 He said the studio's water systems were up to current county code. The blaze burned for more than 12 hours but was contained to the back lot, which straddles a pass through the hills between Hollywood and the San Fernando Valley. Nine firefighters and a sheriff's deputy had minor injuries. The preservation of the sound stages meant the fire was "not disastrous for the overall industry," said Jack Kyser, chief economist at the Los Angeles Economic Development Corp. Sound stages are in high demand by producers and are expensive to build, he said. Art director Francois Audouy helped shoot the final battle scene of "Transformers" on the New York streetscape, and said it was the longest and widest of its kind in southern California. "It's a real shame," Audouy said. "There's a New York street at Warner Bros., and Paramount, as well. But Universal's was considered a very unique option for filmmakers to create that New York look." Another fire at Universal Studios in November 1990 caused $25 million in damage and was started by a security guard who was sentenced to four years in prison after pleading guilty to arson. After that fire the New York streetscape was rebuilt in three months. Associated Press writers Shaya Tayefe Mohajer and Ryan Nakashima in Los Angeles contributed to this report.